From heart-wrenching movies like “Bully”, tragic news stories about bullycides, and the misery we see caused by bullying in our own lives, we know that bullying is an emergency. Emergencies require urgent action. 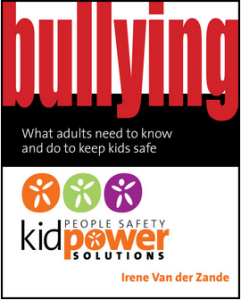 Our Bullying Book has vivid stories, entertaining examples, and clear step-by-step explanations of what to say and do are relevant for addressing bullying with all young people, from toddlers to teenagers, and are even useful in dealing with adult-to-adult bullying. Make it a priority to start to take these five steps TODAY to protect the children and teens in your life from bullying. 1) Insist on powerful, respectful adult leadership. The people caring for kids are doing the most important job in the world. Kids need YOU and all of the adults in their lives to take personal responsibility for managing their emotional and physical safety. Bullying is a safety issue. While children and teens can learn how to help, staying in charge of safety is an ADULT responsibility. Every adult in a child’s life is responsible for ensuring that each child is safe and acts safely towards others. Children and teens learn more from what they see us doing more than anything we can tell them. Positive adult leadership means providing a good role model by staying assertive and respectful even under pressure or when others are being rude — and insisting that all adults who are in charge of your kids do the same. Adult leadership means not giving your power away. No matter what position of authority someone holds, speak up if this person’s behavior or failure to act makes you uncomfortable. Insist on having the problem fixed. When it comes to your child’s safety, don’t take “No” for an answer. Listen in a calm, caring way when young people come to you with their problems: No matter what you think they should have done differently or how trivial it seems to you, no matter how busy you are, start by saying, “Thank you for telling me.” Remember that a child who is complaining about someone needs help – even if this help is in finding more positive ways of getting attention or being powerful. Be compassionate rather than telling kids not to be upset or giving a lecture. Ignoring or suppressing upset feelings might cause a child to hide these feelings from you but does not make the hurt go away. Hidden hurt can build up like the pressure inside of a soda bottle and might explode into unsafe actions. Instead, kids can learn to manage upset feelings if they feel safe talking about them, get support in solving problems, and learn how to manage their emotions. Take charge of your own feelings so that you act calmly instead of overreacting. It’s normal to feel worried and upset when you learn about a potential threat to your child’s well being, but if you get very upset, your child may try to take care of you or shut down. 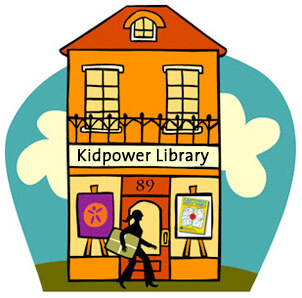 Having the child learn skills through a class such as those offered by Kidpower. For more ideas on what to do if your child is being bullied, see Bullying in Schools: Seven Solutions for Parents. 3) Keep your radar on. Stay aware of what kids are saying and doing. The best anti-bullying programs in the world won’t work if the adults in charge don’t know what their kids are doing and saying. Any of us can become so focused on a conversation or an activity that we don’t see what is happening around us. 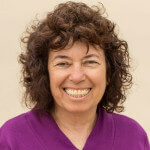 The problem is that a lot of bullying happens under the noses of adults who are so involved in talking to each other or getting something finished that they lose track of what is happening with their kids. Not noticing a bullying problem happening in front of you sends a contradictory message to kids about whether or not adults mean what they say about this behavior being wrong. 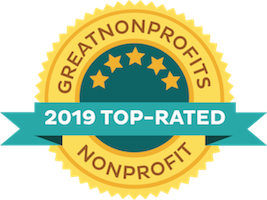 No matter how busy or distracted you are, check out what is happening with the young people in your care. What’s going on with that cluster of kids in the corner or by the slide? How’s the girl with the quick temper doing? What about the boy who often seems lost and unhappy? Develop the skill of Splitting Your Attention to avoid tunnel vision. When you have kids in your care, interrupt what you are doing to observe what the kids are doing as well as what else is happening around you. You also want to Keep Your Radar On about what is happening in popular culture, media and the internet. For example, a joke about “Kick a Ginger Day” on the satirical TV show South Park inspired a Facebook campaign that led to assaults on a number of redheaded kids, teens, and even adults. Keeping Your Radar On will prepare you to step in to stop or redirect unsafe behavior. 4) Don’t let kids throw stones. Intervene immediately in a powerful, respectful way so that you stop a child being unkind to another with the same determination that you would stop that child from throwing a rock through a window. If we saw kids throwing rocks at each other or at windows, we would immediately react, because we can see the damage it causes. Even if a rock doesn’t land, we understand that getting hit by a rock can be dangerous and might break something important. Emotional rocks like teasing can shatter the windows of a vulnerable child’s soul. Tell kids when their words or actions can be hurtful. Coach them to practice saying something respectful and doing something safer instead. Stop jokes like, ‘You’re so gay… That’s retarded… You’re fat.” Even if everyone in the room says it’s okay, explain that putdowns like these are hurtful. Disrespectful language, even if there is no bad intention, has no place in a healthy, caring environment. Teach kids that “making fun” of anyone in hurtful ways is cruel. Remember that disrespectful or threatening gestures, sounds, and facial expressions are also ways to throw emotional stones. Speaking Up About Putdowns describes how to address common negative reactions when someone is told that his or her language is hurtful. 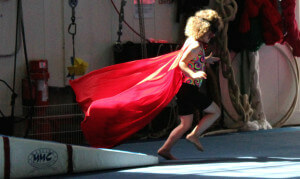 5) Teach kids skills for taking charge of their safety. People are more prepared to do in real life what they have practiced. 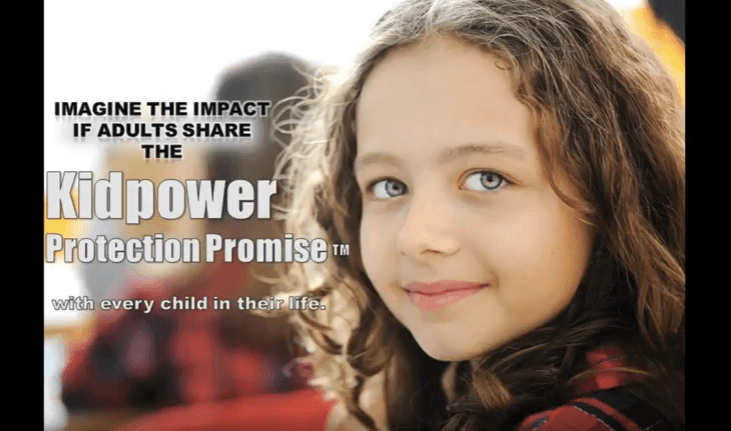 Kidpower’s Positive Practice Teaching Method gives children and teens opportunities to be successful in rehearsing how to take charge of their emotional and physical safety in situations that are relevant to their lives. Defend themselves from an assault. See How to Pick A Good Self-Defense Program. All of the above actions take awareness of the importance of stopping bullying, motivation do something to solve the problem even if it is hard, and skills. 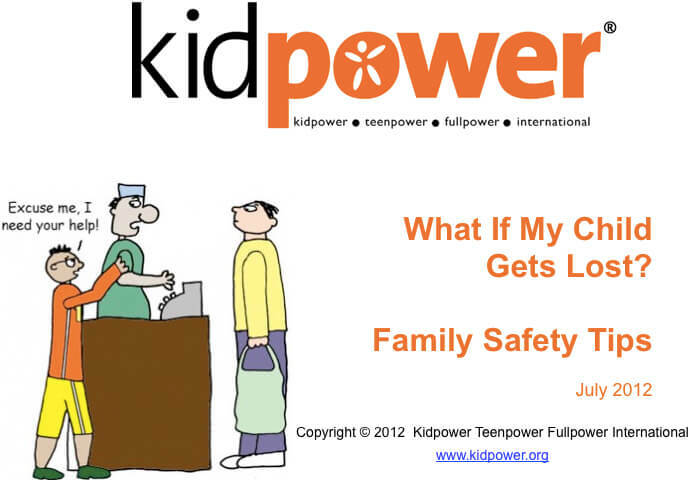 If you aren’t sure what to do or get stuck, contact Kidpower at safety@kidpower.org. We have a wide range of resources that can help. 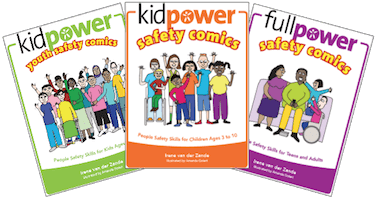 Check out the Kidpower Comics with age-appropriate editions for younger kids, youth, and teens/young adults!